A car accident left Dawn Greene-Bublitz a quadriplegic, and a long hospital and nursing home stay necessitated that she find foster care for her dogs. By the time she emerged, they no longer knew her, and she opted to leave them where they were rather than uproot them again. Hope is not just a couch potato. But she missed her dogs, so even though she wasn’t quite sure she was ready for one yet, she began browsing on Petfinder. 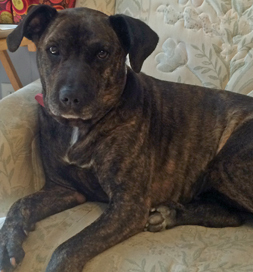 Right away, she saw Hope, a Pit Bull mix who was listed by Tina’s K-9 Rescue in Sparta, WI. “I just scanned her profile quickly because she seemed to be a little bit bigger than I wanted,” Dawn says, and she went on looking. Several months later, she decided it was time to adopt and began searching Petfinder in earnest. Up popped Hope again, still at the shelter. This time, she arranged to meet her. When the caregiver let Hope out of her crate, she mingled peaceably with the cats in the place, which given that Dawn had one, was a good sign. She also wasn’t intimidated by Dawn’s wheelchair, so Dawn decided to adopt her. Hope is a mellow dog, who is content to lie on the couch, but she also likes to wrestle with Dawn’s 15-year-old son, Scott. “She is very gentle about it; if he puts his arms around her, she just goes down to the floor,” Dawn says. For Dawn, Hope offered loving companionship, while Dawn offered Hope a new day. It was an ideal match.